Thomas Davis Bids Goodbye to Carolina Panthers! Thank You, Captain, said the Carolina Panthers. It was an emotional farewell for Thomas Davis after being with the Panthers for 14 long and wonderful years. 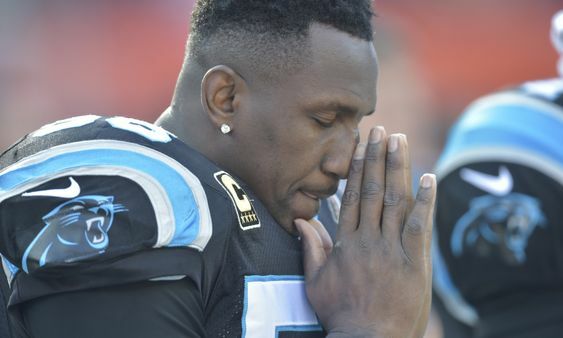 The longtime linebacker Thomas Davis is saying goodbye to Carolina Panthers. The news was revealed by the Captain in an emotional video which he posted with a heartfelt message on his Twitter account this Wednesday. Panthers were the first team Davis ever played for in 2005. After his retirement, he will be an unrestricted free agent for the new league which begins from 13 March. Davis already gave out the indication that 2018 will be his last NFL season. However, after being suspended from the first four games, Thomas Davis had second thoughts and is planning to continue his career in 2019. In his Twitter video, he said that he has still got some more football left in him. In his emotional message, he thanked the entire Carolina Panthers including his teammates, coach and support staffs. He said that his fourteen years with the Panthers will be forever in his memories and he can’t thank them enough for all the love and support they gave him over the years. Davis was drafted into NFL from the University of Georgia in 2005 as a reserve safety and a rookie linebacker. Thomas fully transitioned himself into a permanent linebacker in the next year and became a productive starter for the Panthers. He had a seven months break during 2009-10 when he suffered from a torn ligament in his right knee. Thomas Davis had the same injury in the very next season and struggled to cope up with it. In 2011, the same injury hit him again. But Davis didn’t back down and he returned once again in 2012 and from there, there was no turning back. Till 2018, Davis has registered a career total tackles of 1,077 and it is the second best among all the active players. Ivanka Trump to Become The Next World Bank President? Floyd Mayweather vs. Conor McGregor 2: Who Would Win in a Rematch? Will Avengers Endgame have Stan Lee cameo?